The day’s work fell to Mr MWCED, who to his credit did a lot of prep the day before. I did glaze the ham, albeit a small one – as the table this year was set for 3. Still, for 3 people we did good. We started with Prawns, with a coriander and chilli sauce, set on a bed of freshly picked rocket. Mmmmmmm. A Moet & Chandon Rose Imperial went well with this, it had light berry flavours, was crisp and reasonably dry. Following the first course we had a small break and launched into the mains. There was a deboned and stuffed chicken, sticky glazed roast ham with mustard sauces, new potatoes and roasted asparagus, plus a freshly picked lettuce, rocket and snow pea salad. Just a perfect combination. The chicken had an Italian pork sausage, cranberry and walnut stuffing. A total favourite combination of flavours. Mr MWCED used a number of recipes to come up with just the right stuffing mix. The ham was from a Jamie Oliver recipe out of the December 2015 Issue 116 Woolworths Fresh magazine (recipe here). It had ginger, hoisin sauce, soy, five spice, sesame oil, nutmeg and much more. Our piece of ham was about half the size that the recipe called for, though I made about the same amount of glaze. It was Very Delicious. And then, do you know, we were so full that the thought of dessert just didn’t tempt us. So the Raspberry Parfait just had to wait until another day. Now of course it has been ham sandwiches all the way! Who can complain though, wonderful weather, great people, tasty food and good wine. Roll on 2016! A Merry Christmas and Best New Year Wishes to All. From time to time I want some tasty food, but just don’t feel like expending the energy to put all the ingredients together. At times like that I think a few shortcuts are acceptable. In this recipe the shortcuts are the sauces. Substitute with your favourites – and of course, you can always cook them from scratch (which I often do). 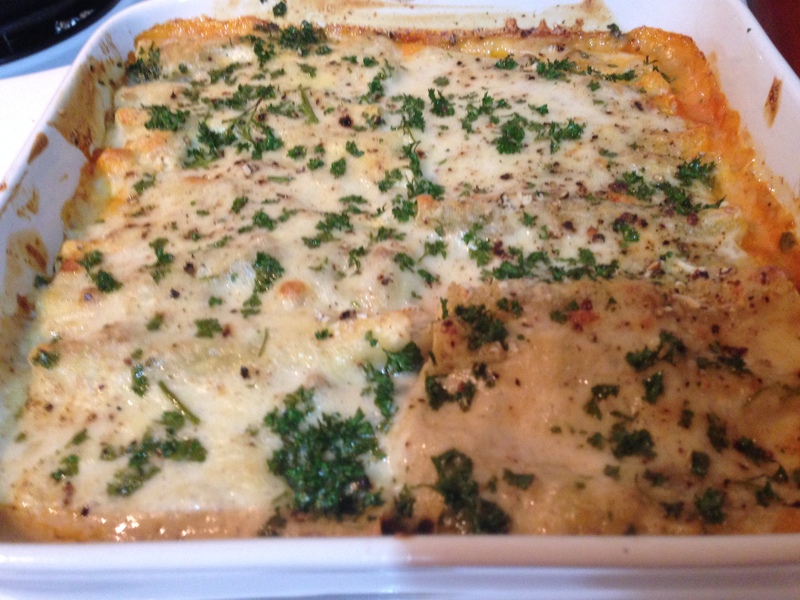 The pasta I already had in the freezer from an earlier time when I had made cannelloni – phew that was lucky. We have a lot of walnuts which need using – so I spent a little time in the afternoon shelling a bowl full. We both love using walnuts in our cooking. When I made the filling I could have gobbled it all up without any further cooking – it smelt SO good. But I held back. Difficult though. Pulse ¾ cup walnuts with pesto (add a little oil if too dry). Chop shallots and garlic. Heat a pan with about 1 tablespoon olive oil and add shallots and garlic. When soft add chicken and cook until chicken is just cooked. Add the baby spinach and cook until spinach is wilted. Take pan off the heat and let cool. When cool combine chicken mixture with the pulsed walnuts and pesto. Add grated parmesan, and salt and pepper to taste. Mixture should be slightly moist, but not runny. Cover bottom of ovenproof dish with the passata. Dip a cannelloni sheet in hot water to soften and place on a flat surface. Spoon chicken filling along the longer pasta sheet edge and roll up to form a cylinder. Place in the dish, seam side down. Repeat to use all sheets. 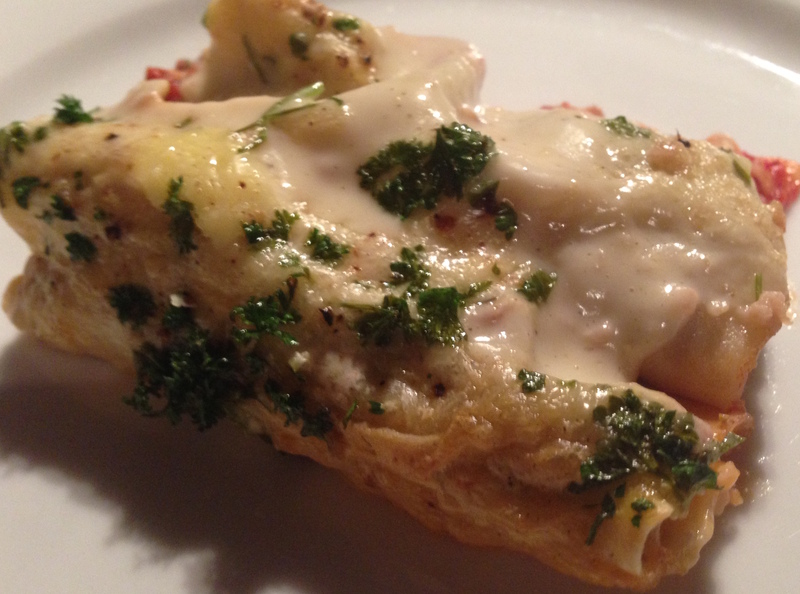 Pour carbonara sauce over cannelloni, cover and bake at 180°C for 30 minutes. Serve sprinkled with remaining walnuts and some chopped parsley. Good with a fresh salad and some warm garlic bread.